Burgundy. There’s something quite magical and romantic about touring around the French countryside, stopping off at picturesque villages for a café noir, visiting delightful, historical Chateaux, and of course, tasting excellent food accompanied by unforgettable wines. If you love to treat yourself to a bon vin combined with culture and an experience that your palate will never forget, then visiting the area of Burgundy could be a trip of a lifetime. You don’t need to be a wine expert by any means to enjoy the area of Burgundy but reading up a bit on the local wines before you go will make your holiday a lot more interesting. Certainly since returning from my wine-tasting trip in this beautiful part of France, I’ve a far greater interest in wines than before. The whole gastronomic experience of wining and dining in this area of France is fabulous. Even people-watching in the restaurants is fascinating. The French like to dress up to dine out, are enviably elegant, and that’s just the dogs! I can’t imagine taking my pet mutt into town for a meal in Dublin but in France, well, c’est la vie, and canines are very much part of the family. Mind you, the dogs in French restaurants are a complete credit to their owners and usually sleep under the table until it’s time to say au-revoir. I arrived in the small village of Nuits-Saint-George in the evening with the sun gently setting and on my way to the hotel was struck by the sheer breath-taking beauty of the region. Having lived in France for two years and travelled extensively within the country I thought I’d seen it all. Our hotel, Chateau de Villars Fontaine, was an absolute gem. A real chateau, it is magnificently furnished and has a really peaceful atmosphere. My room with views over the beautiful back gardens even boasted a four poster bed making me feel like a real princess! The owner was an interesting, very welcoming gentleman called Bernard who treated us more like old friends than guests. I thought the food here was delicious and the place was full even though it was Monday – a sure sign of its popularity. The following morning we were up bright and early and it was off to school! Our introduction to Burgundy at the Ecole des Vins de Bourgogne lasted about an hour and a half. 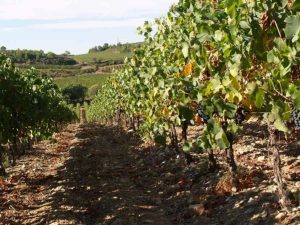 As a complete wine novice I found this practical and interactive introductory course about the region and its wines to be useful and would definitely recommend it to anybody looking for a crash course. The very famous tourist attraction, Hospices de Beaune was definitely a highlight of the trip and anybody interested in the history of wine sales will enjoy this must-see attraction (www.hospices-de-beaune.com). After tasting some spectacular wines in the cellar here we continued walking through the gorgeously quaint town of Beaune until we reached the mustard mill where we actually got to make our own mustard which was fun. We ate outside as we did for most of our trip as the sun was scorching – just don’t forget the sun factor if your skin is fair because you’ll be mostly dining al fresco. If cycling is your thing, you can hire a bike and do a cycling tour alongside the Burgundy canal, from Rully to Mercurey (this route only available to pedestrians and cyclists). To organise it phone +33 380 26 22 12 or email beaune@mail.promenades-en-France.com. However as the bike ride is approximately two hours so make sure you’re fit and healthy.